This is suitable for 1 adult. Made with cotton fabric on top and tarpaulin fabric at the bottom, with various designs and colours. 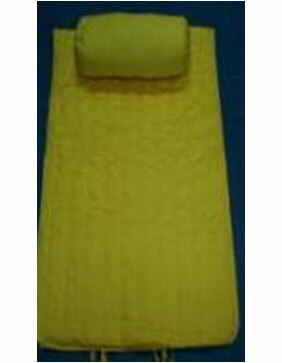 Both the fabrics are quilted with polyester wadding, to give you extra comfort. Easy to carry and maintain. Comes with a pillow. Packed in a coordinated fabric bag.